USB over Ethernet Connector eliminates problems you may encounter while attempting to access USB over Ethernet or using devices that are attached to remote computers. You can share USB over network and use them as if they were locally connected to your system. Simply install USB over Ethernet Connector on both the machine with the locally attached device (server) and the remote machine that wants to access the device (client). No other hardware is required as the USB over Ethernet Connector software will handle all aspects of the connectivity. This software solution for sharing USB over Ethernet supports both clients and servers running Windows, Linux or Mac operating systems. In addition to accessing USB devices over Ethernet, you can also access and use local USB devices in virtual sessions, leading to server and workstation virtualization. 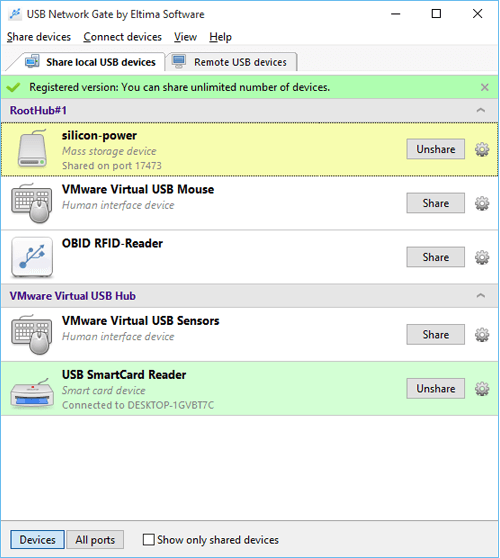 Per-session isolation is supported, meaning the when using USB over Ethernet Connector you can assign USB devices to a designated user in the RDP session (currently for USB flash drives and cameras). Version 7.0 of USB over Ethernet Connector introduced per-session USB device isolation and support for ICA by Citrix and Windows 10. You can access and use USB devices on a guest OS of virtual environments such as VMware ESX, Citrix XenDesktop, Microsoft Hyper-V, Windows Virtual PC, etc. USB over Ethernet Connector enables you to use any locally attached USB device remotely, and its functionality can be integrated into your own software by way of OEM licensing. Added: localization to the app interface; full support of Windows Server 2016; displaying the amount of data transferred in both directions for each connection; displaying the data transfer speed in both directions for each connection. ; Numerous improvements and fixes.